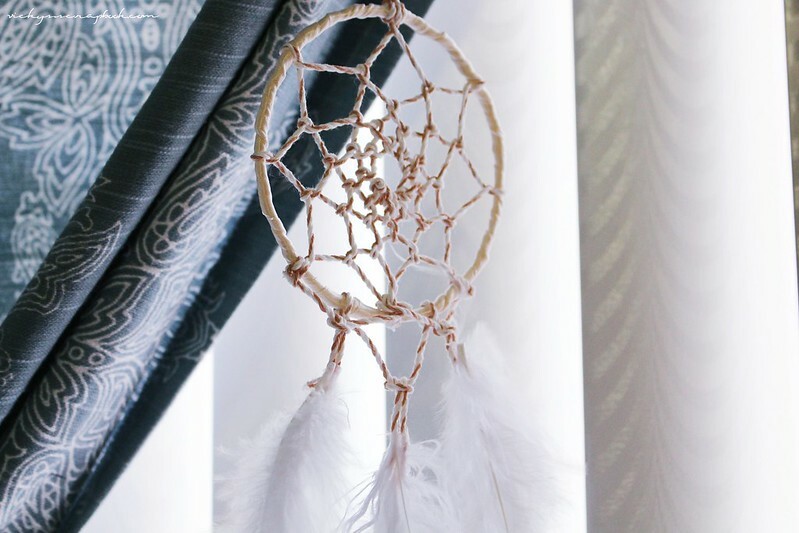 The dream catcher originates from Native Americans cultures and is believed to “filter out all bad dreams and only allow good thoughts to enter our mind” (Wikipedia). I was very inspired to create one myself after seeing it on the Urban Outfitters’ site for $99.00 and began looking for tutorials which I found here and here. Dreamcatchers were originally made from willow hoops and often wrapped with natural materials. I don’t have any of those materials on hand so I used some wires and ribbon to make a non-traditional dream catcher. I looped the wire around a large cup twice to form a circle and then taped the ends together. I glued down one piece of the beige colored ribbon to the circle and began wrapping the circle with the ribbon (while simultaneously adding glue along the way). Once I wrapped the entire circle with ribbon, I glued down the ends to secure it. Dreamcatchers have a lot of different weavings and since this is my first time making one, I’m just referencing a common pattern. I started by tying some twine, which was leftover from Christmas, on one end of the circle and began looping it around the circle until I have created an octagon shape. A lot of the tutorials I’ve read, mentioned adding beads to them but I prefer to not add any onto mine. After the initial “octagon” that was created, I need to start looping in the inner layers in a similar fashion. I would loop it onto the edges of the “octagon” and pulled it tight. Once this second layer was finished, I would repeat it until I’m left with a small circle in the middle and at this point I could knot it and cut off the excess. Dreamcatchers could really be decorated in any way you like so I used the excess twine to create 3 loops on the bottom of the circle and tied 3 small pieces onto those loops. I only had white feathers at home so I glued those onto the ends of the small pieces of twine. To tie it above my bed, I added another piece of twine onto the very top of the circle. Dream catchers have a very interesting story and purpose; if I get a chance I would love to learn how to make it the traditional way like the Ojibwe people once did. Hope I’ll have some good dreams later tonight. Whoa as always I’m impressed with your ideas and skills! Your dream catcher looks fabulous! Dream catchers are so beautiful in both their concept and aesthetic! I love the one you made here. I remember making one when I was little but I have no idea where it went! Great post like always Vicky! Way to improvise with the materials. It turned out well! Stunning. 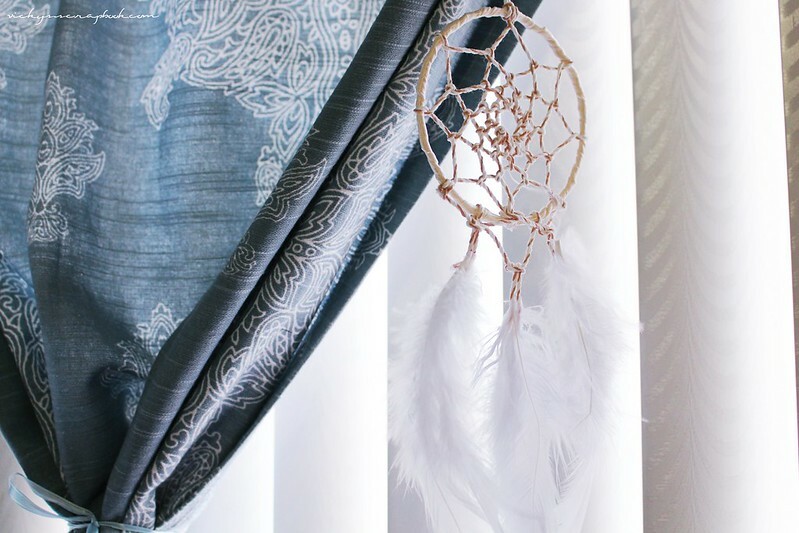 Love the colours you used for the dream catcher, make it look very dreamy! Omfg I actually love your blog,I love DIY but I’m not very good at it,follow for follow?